14:07 left in the first with the Badgers down 1-0. Gophers up 3-1 in shots in the early going. UW with some high-quality looks, but the Mavericks kill the penalty. 0-0 13:24 remaining in the first. Just under ten to play in the first and the #Gophers still lead 1-0. SOG 3-1, Minnesota. Halfway through the opening frame, 1-0 Gophers. Pitlick with a quick shot off after a Kloos faceoff win, Berry with the save. Media timeout at 9:08. 9:08 left in the first, 1-0 Minnesota over UW. We went about 6 minutes between shots on goal there. Gophers lead that 4-1. 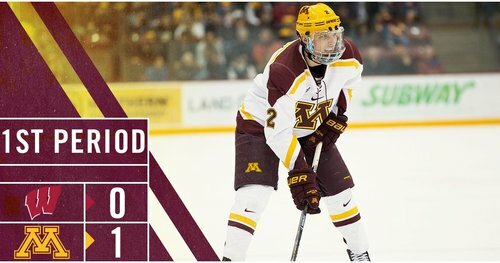 #Gophers will head to the PK as Zuhlsdorf is called for hooking. Schierhorn stops Ustaski with his left pad but the Badgers go to the PP on a Zuhlsdorf hooking penalty. Roque is called for hooking just as Pankowski's penalty was about to expire. Kloos gets free on the PK and gets a wrister off that Berry saves. 1:29 remaining in the kill. Badgers head to their first power play of the game with 7:04 left in the period. 1-0 Gophers. Nothing to show for UW on the man advantage. They are still down by one with five minutes to go in the first. Final media timeout of the first period with 1:28 to play. #Gophers lead in shots 9-5. 1:28 left in the first, Gophers still lead Badgers 1-0. UW has had a rough time on zone entries. 1:30 left in the first, Minnesota up 1-0. They lead SOG 9-5. One minute remaining in the first period! Minnesota's Bristedt goes off for boarding Tischke with 19.1 left in the first. #Gophers will head to the PK with 19 seconds remaining in the first period as Bristedt is called for boarding. UW gets another power play with 19.1 seconds left in the period as the Gophers are called for boarding. END 1: Minnesota leads Wisconsin 1-0 on Vinni Lettieri's goal 28 seconds into the game. Shots on goal 11-5 for the Gophers. Tischke was slow in getting up after the hit that led to Bristedt's boarding penalty. Tony Granato had words with the refs on way off ice. Five shots on goal is the #Badgers ' fewest in a regulation period since 4 in the 2nd and 3rd at Michigan State on Feb. 3. #Badgers open the second period with 1:41 of power-play time, trailing Minnesota 1-0. We are underway for the second period here at Mariucci! #Gophers starting on the penalty kill. Badgers and Gophers back out for the second period. UW starts with 1:41 of power play time. #Gophers back at full strength! Teams back to even strength. Sadek with a blast from the point that Vinni tries to tip but Berry makes the save. 17:41 to play in the second. Goal, Wisconsin. Frederic gets one by Schierhorn from the cirlce and we are tied at one. 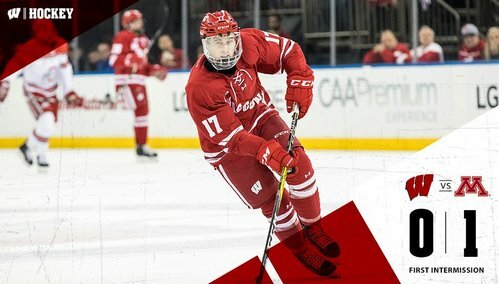 BADGERS GOAL: Trent Frederic scores off a Minnesota turnover, pass from Besse, and it's 1-1 with 16:18 left in the second. Media timeout with 14:51 remaining in the second period. #Gophers and Badgers tied at one. Question here on whether Minnesota scored. Berry reached behind to stop a shot on the line. Hard to tell.